Regina Shober Gray’s diary shows her as part of a wide network of families: in the following entries, from summer and fall in 1860, we see her entertaining her sister in Manchester; receiving visits from her husband’s uncle and her own stepmother in Boston; sending her son off to visit his uncle and aunt in Brookline; and whiling away a day in some of Boston’s many bookstores. Manchester, Massachusetts, Saturday, 11 August 1860: A rainy day – we all sat in Mrs. Gordon’s rooms till after luncheon. Then Lizzie [Shober] and I read aloud in my room – “Leslie’s Autobiography,” which we found very pleasant reading. We had neither bath[e] nor walk to-day. Dr. Gordon came down this p.m. bringing letters from Rebecca [Wainwright], Dr. G., & Mary S[hober]. Morris [Gray] went off fishing with the girls, and caught a rock-cod, which he pulled up bravely to the level wharf, and then in his tremulous excitement let slip back into the water!! The boys took Mary [Gray] out in the dory, but the swell made her sick. We have nice letters from Annie & Ellen [Gray]. Wednesday, 5 September 1860: Frank’s 14th birthday – and rather a hard one, his eyes being so painful that he has kept on the couch all day with iced water on them. Lizzie and I went to make some calls, and get him a birth-day present – we selected Wood’s Illus’d. Nat. History. This p.m. Lizzie drove with Fred Gray to Mt. Auburn [Cemetery in Cambridge]. Thursday, 6 September 1860: We intended to give this morning to the Atheneum but the oppressive heat has kept us housed all day. We finished the “Wept of Wishton Wish.” Frank found it so interesting that we shall send for the “Last of the Mohicans” – one is thankful to beguile his enforced idleness – he gets quite out of heart, poor boy, with these constant draw backs. [Dr. Gray’s uncle] Mr. Swett came in this evg., and Lizzie for his entertainment revived some of her old Scotch and Irish songs. Mrs. Gordon called this morning. Saturday, 8 September 1860: Lizzie and I were to take the children to the “Ravels” this p.m., but the rain prevented. Frank went to Pine Bank as the day was cloudy, and there would be no glare from the pond to injure his eyes. And we read aloud Mrs. Gore’s sprightly “Memoirs of a Peeress.” Hepsa [Bradlee] came in to see about Mrs. Parker’s School for [her daughter] Ellen – but I fear it is too young a set for her – she is a great girl now, 14 years old. Monday, 1 October 1860: Mrs. Shober, Aunt Sarah [Bradlee], and Rebecca came in yesterday p.m. to say good bye – and I suppose they started for Lenox this morning (not Aunt S.), and Fred got off to Princeton. Will Gray is to follow him tomorrow. Not a very favorable day. Mrs. Gray expects Aunt Eliza with Mrs. Clay and the children tonight. I am reading … “Misrepresentation,” a very interesting novel. Thursday, 13 December 1860: Busy among book stores all day – some selections prove satisfactory on inspection, and some must be returned. What a tempting place a book store is. Burnham showed me such a beautiful English Shakespeare in half-calf – Valpy’s edition 15 vols. for $25 – more than worth the money to any one who could afford it at all. Mary Avery Upham (1819–1911) was married to Dr. Charles Gordon 1845–72. The Gray and Gordon families were sharing a house in Manchester. Perhaps Autobiographical Recollections of the Late Charles Robert Leslie, R.A., published in Boston in 1860. The diarist’s sister Mary Morris Shober (1816–1873). Mrs. Gray’s youngest son, Morris Gray (1856–1931). Dr. Gray’s unmarried sisters Anne Eliza Gray (1819–1884) and Ellen Gray (1830–1921). Dr. Gray’s niece, Frances Loring Gray (1843–1919), who married William Adams Walker Stewart in 1874. The Wept of Wish Ton-Wish (1829) by James Fenimore Cooper (1789–1851). The Illustrated Natural History (1859) by John George Wood (1827–1889). Dr. Gray’s brother Frederic Gray (1815–1877). Cooper’s The Last of the Mohicans: A Narrative of 1757 (1826). Samuel Swett (1782–1866) was married to Lucia Gray 1807–44. For the pantomime troupe’s last appearance at the Boston Academy of Music. The Brookline home of Fanny Gray’s parents, William and Sallie Gray. Memoirs of a Peeress (1837) by Catherine Grace Frances (Moody) Gore (1799–1861). Hepsa Hall (1821–1908) was married to Henry Bradlee 1845–61. Mrs. Gray’s stepmother, Lucy Hall Bradlee (1806–1902), was married to Samuel Lieberkuhn Shober 1830–47; Henry Bradlee was her half-brother. Fanny Gray’s brother William Gray Jr. (1837–1886). Dr. Gray’s mother Mary Clay (1790–1867) was married to William Rufus Gray 1809–31. 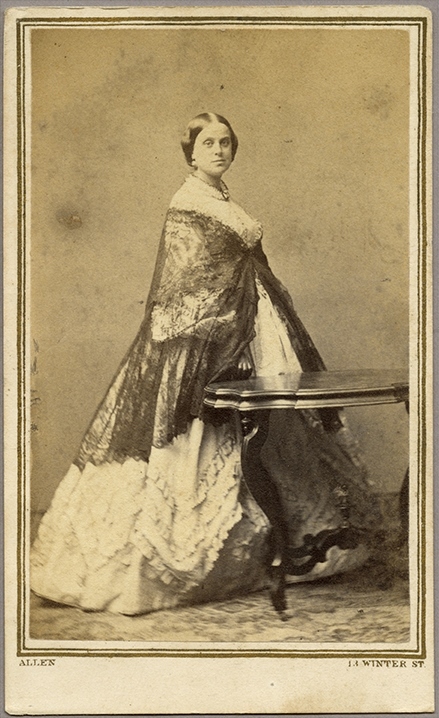 Mrs. William R. Gray’s sister Eliza Caroline Clay (1809–1895). Matilda Willis McAllister (1818–1869) married Mrs. William R. Gray’s brother Thomas Savage Clay in 1840. Misrepresentation: A Novel (1860) by Anna Harriet Drury (1824–1912). The Works of Shakespeare, published 1832–34 by Abraham John Valpy (1787–1854).